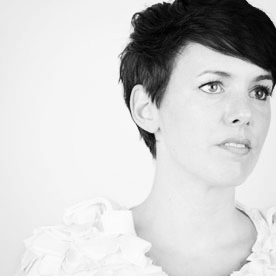 It’s probably Anna Meredith’s academic musical background that makes her sonic disorder seem so measured. Having been a resident of the Scottish Symphony Orchestra, Meredith’s incredible handle of sound and instrumentation is what makes her experimental work so engaging and what makes her live show so unforgettable. The crescendos she and her band reach are sprawling, busy and layered but every additional element is detectable and uncovered. Having released ‘Jet Black Raider’ on super-label Moshi Moshi in August last year, the prospect of a full length from the 35 year old Edinburgh native is one worth catching on to. This is a lady who stretches sound as far as it can go but never tears it’s muscles. Then along came Calvi. Since she landed in 2005, Anna Calvi has become the matriarch Domino’s plethora of alternative heavyweights. Her latest record ‘One Breath’ rips off the curtains and lets light burn in on her sound to create a triumphant, anthemic record about hope, dread and mystery. At this show in Manchester’s best new venue, the record’s sense of conviction was communicated perfectly through her faultless vocal, world-class instrumentation and a nature that is withdrawn but perfectly self-assured. Tunes like ‘Eliza’ and ‘Bleed Into Me’ emit a very British breed of luxurious cinematic beauty. This seeps through the entire Anna Calvi experience from her high-heeled guitar solos to her heavily stylized get-up. When she breaks off from her own catalogue to cover Bruce Springsteen’s ‘Fire’, her fierceness makes lyrics like, “A grip so tight I couldn’t tear it apart” seem perfectly akin to the delicate brutality of her sound. Here is a woman whose music will tear you apart then sew you back up with a needle and thread. ‘Desire’ from the first album shows Calvi in her musical element. A vocal range that she can navigate perfectly and an ability to play the guitar like one of the coolest people we have ever seen. Period. Anna Calvi has been around for a while now- this second record and the shows that have come with it are testament to the best kind of rebirth. Having recorded in France and Texas, Calvi has honed her craft and become a grande dame of British alternative music. The vacant, forbidding nature of Manchester’s Albert Hall was playing host to a musician with life and a musician capable to breathing that straight in to her audience.